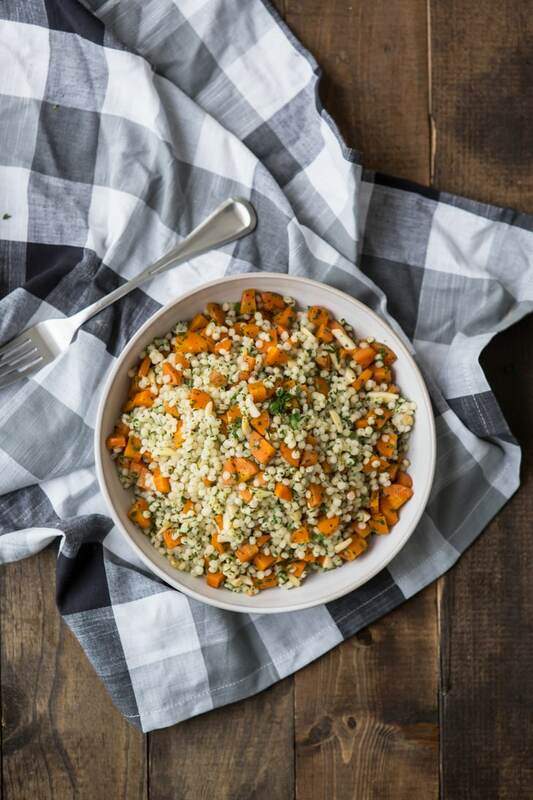 Roasted Carrots and Couscous with Gremolata | Naturally. I am occasionally grateful for my ability to play it cool even with these crazy pregnancy hormones (and yes, on many occasions the hormones win). While at the market this past weekend, I was waiting in line to pay for some strawberries when the person in front of me asked if he could get his beet greens chopped of the beets. It took everything in my power not to yell ‘NO, not the beet greens!” But alas, I figured getting yelled at by some potentially emotional pregnant lady was not what this guy had in mind as a Saturday morning activity. One of the reason I love going to the market is it’s one of the only places you can find the entire vegetable. It’s hard for grocery stores to do this as the greens on these vegetables (like beets and carrots) draw out the moisture leaving the vegetable soft. For me, however, it’s one of my favorite treats. This particular recipe uses the carrot tops in a gremolata mix with traditional parsley. I didn’t expect a great deal of ‘this recipe is amazing’ when I took a bite, but I couldn’t stop eating it was that good. The pairing of the fresh parsley and lemon with the bit of earthiness from the carrot may be one of my new favorite combinations! This is a really nice base for addition/swapping in ingredients. If you want a bit more bulk to this dish, I suggest adding a few chickpeas and maybe some feta. Want to make it gluten-free? I would recommend quinoa (for a quick dish) or whole sorghum (for slightly longer cooking time). Preheat oven to 400˚. Remove tops from carrots and slice in half lengthwise, then slice in half again. 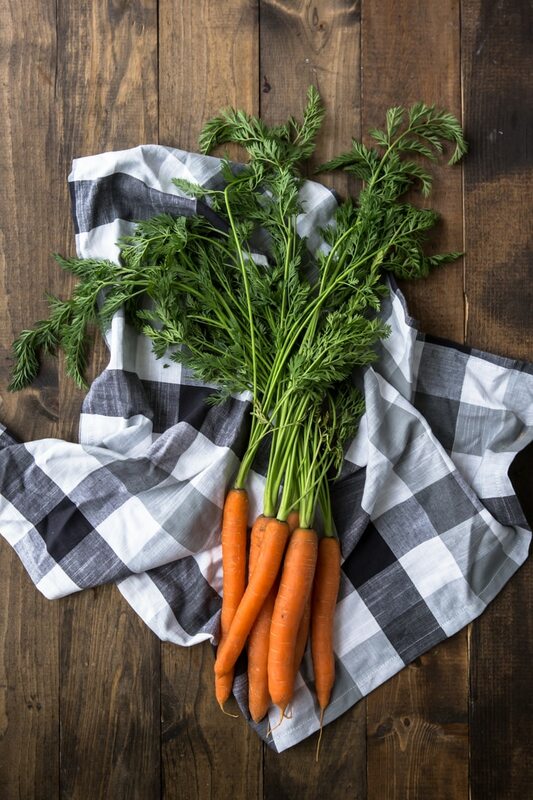 Chop each into 1/4″ thick pieces (leaving you with small, quarter pieces of carrots). You will want approximately 2 cups of diced carrots. Toss with olive oil, salt, and pepper and spread into a roasting pan. Roast carrots until tender but still have some crispness left, 20 to 25 minutes. 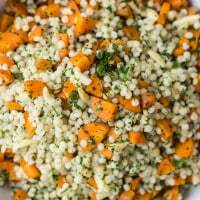 While the carrots are roasting, bring a pot of water to a boil, add couscous, and cook for 8 minutes, remove from heat, and allow to sit until just past the al dente stage (tasting is your best friend). Drain, rinse, and toss with the one teaspoon of olive oil. To make the gremolata, roughly chop the carrot greens, parsley, and garlic. Add the zest and continue to chop until the mixture is well combined and the garlic/herbs are in fine pieces. 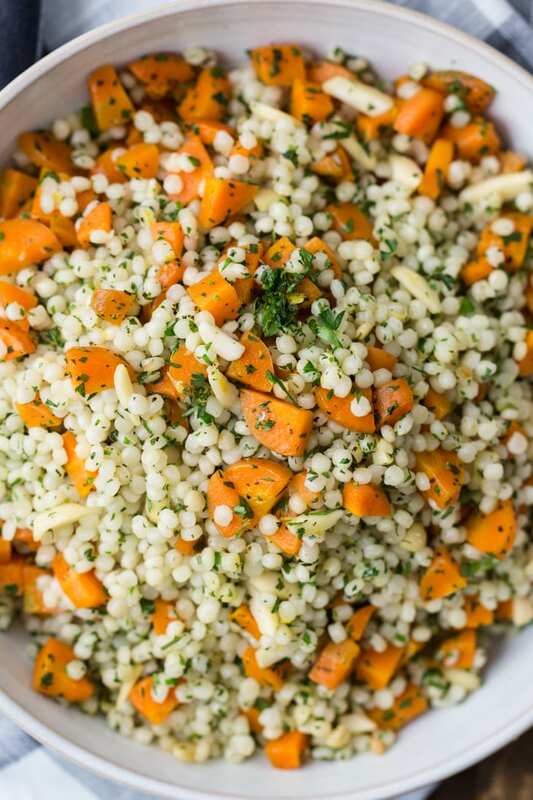 Once carrots are done, combine with the couscous, gremolata, and almond slivers. Squeeze a bit of fresh lime juice on top and serve. If you’re unable to find carrots with the stems, use all parsley for the gremolata. Wow, this gremolata really does look amazing, and it seems like the perfect flavor enhancer for this dish. You’re right though, people don’t know how nutritious the greens can be nor how to use them. This is the perfect “starter” recipe!! omg this looks absolutely scrumptious!!! I’m guilty of tossing the greens more than I like to admit. This inspires me to be more creative in using them. Beautiful dish! I’m guilty of tossing the greens. This will be my first time using the greens. Can’t wait to try it. I’m lately pretty obsessed with carrots, I love them! but I always buy them in the grocery store and they come small and without the green tops, I shall buy them in the market instead 🙂 Great recipe! I just (kind of) made this. I had bagged carrots and a dying bunch of cilantro so I improvised a bit and it turned out great! I took your advice and bulked it up with garbanzos and feta, as well as tossed in some broccoli with the carrots. I also added a poached egg on top. It was quick and easy, and I imagine the leftovers will hold up nicely for lunch. Thanks! Loved this recipe, and I’m looking forward to the leftovers too. I used a combination of carrot tops, cilantro, and basil for the pesto. The farmer at the market asked if I wanted the carrot tops cut off and I said no, that I’d be making pesto with it. She crinkled her nose. Ha! Guess the Swiss don’t usually use the carrot greens. 😉 Next time I go back I can tell her they in fact work very well in pesto!